Every book has a story of its own, a path leading from the initial idea that sparked it to its emergence into the world in published form. No two books follow quite the same path, but all are shaped by a similar array of market forces and writing craft concerns, as well as by a cast of characters stretching beyond the author. Behind the Book explores how eleven contemporary first-time authors, in genres ranging from post-apocalyptic fiction to young adult fantasy to travel memoir, navigated these pathways with their debut works. Based on extensive interviews with the authors, it covers the process of writing and publishing a book from beginning to end, including idea generation, developing a process, building a support network, revising the manuscript, finding the right approach to publication, building awareness, and ultimately moving on to the next project. It also includes insights from editors, agents, publishers, and others who helped to bring these projects to life. 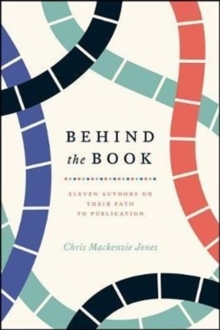 Unlike other books on writing craft, Behind the Book looks at the larger picture of how an author's work and choices can affect the outcome of a project. The authors profiled in each story open up about their challenges, mistakes, and successes. While their paths to publication may be unique, together they offer important lessons that authors of all types can apply to their own writing journeys.